I have been wanting to make the chocolate loaf from Apples for Jam:Tessa Kiros for some time now but had put bread making on the back burner for a while (Husband buys bread when it’s on sale and fills the freezer and I haven’t needed bread therapy for months). But, as previously mentioned on these pages I am trying to improve the variety in Spider’s packed lunch so following a tip from The Book fo Sandwiches:Gwen Robyns I gave him a banana sandwiches on chocolate bread. It was, an unqualified failure ! This despite me telling him what I was doing the night before (“sorry Mummy cannot come and play the Bee game with you now, she’s making chocolate bread for your sandwiches”)…he loved the idea. The next day however, wouldn’t touch them. Part of me wishes I had found this post before. The post not only gives the recipe but cautions the cook that it is not as sweet as you might hope, and if I’m being honest it does need to be a bit sweeter. However since I could tell from the sandwich remains that he hadn’t even touched them so I suspect in Spider’s case he just decided he didn’t want a brown lunch. Anyway, not being one to waste food I’m currently noshing a toasted version with damson jam which seems to work as the jam is very sweet and the loaf slightly bitter. Cooking in this house has been a bit routine and dreary of late. I haven’t had any desire to write about anything for awhile hence the relative inactivity on this blog. I have been a bit depressed too due to “events” which admittedly did have the strange effect of making me feel that I needed to buy a cookbook (Falling Cloudberries:Tessa Kiros, in case you were wondering – I didn’t as I can’t justify even spending £1 at the moment let alone £10 (on offer)). The slugs eating my basil followed by a solicitors letter killed my desire the other week to make cake. I have to make something this weekend as its Teenager’s birthday, and we have friends visiting in the evening and I have promised there will be leftover cake. My current plan is one culled from Caribbean Food:Levi Roots which from reading the recipe appears to a combination of Nigel’s double ginger cake combined with the icing from Nigella’s ginger cake but using lime instead of lemon – now this really did get my taste buds waking up. The other thing that has pricked my culinary interest is that Allegra McEvedy (ex Leon) and Paul Merret (his book about his allotment and cooking from it is currently on my bedside table – I got it for my birthday, it is a slow read for me, his literary style is not doing it for me) have a series coming out next Wednesday called Gastronomy Economy, there is also, surprise surprise a cookbook... if it stops raining I may do a car boot sale and treat myself with the proceeds. As an adult, I hate snow. Snow is stuff for looking at through a double pane of glass with a glass of mulled wine in your hand. Fortunately, having had a brief career as the outdoor type before Spider was born I have kit designed to cope with all weathers – so Spider and I got water and windproofed to the hilt and then set out to join the rest of the village (yes the rest of the village) enjoying the winter wonderland in the farmers field over the road from our house. It really was a lovely little communal scene, you can almost imagine what it used to be round here when the village was the centre of life and not just where you sleep. We made a snowman, and pelted each other with snowballs and made snow angels and snow castles and then ran home laughing and giggling like 2 4 year olds (instead of 1) for a nice warm bath, muffins and hot chocolate…and then pretended we were chameleons in the living room seeing who had the longest tongue. Spider had fun. I joined in without complaint and made sure that he had, ok not the best snowman in the village but certainly the only one with dried lime slices as eyes (the end slice you never put in your gin). Anyway whilst I was getting all sentimental about how great it was that a village can still bond and be communal, Husband had dragged himself off his sick bed to get some milk and other essentials – he was not experiencing communal village life at its best but more the “siege mentality” and everyman from himself. Apparently the shelves in the co op had been emptied of milk and bread within the first hour of being open and rumour has it, it was “all the people that don’t normally come in”. Hey no problem guys, at least you are using it – now make sure you use them more often otherwise they won’t be there next time we get snowed in. Me, admittedly I am making bread this evening, not from fear of shortage but more I actually had the time and half an open packet of yeast to use up. We keep the freezer stocked up with short dated bread anyway ( a full freezer is more efficient) and have 2 litres of semi skimmed UHT in the cupboard at all times. The “bread” is actually “half moon rolls” from Apples for Jam:Tessa Kiros, I have a craving for some soft white rolls…but I think there may be something wrong with my yeast…so I am not too hopeful…half moon rolls are a basic white dough recipe rolled in a particular way. My fridge has been full of suspicious looking bowls of coloured goo for the last week or so. The family has been remarkably tolerant and have even eaten some of it. The first was the sweet potato I mentioned last week. Purple as the ones I picked up turned out not to be orange fleshed. They were turned into falafel, which are ok, but not a patch on chickpea ones. The second bowl was orange pulp…I mentioned to Husband that the last lot of clementines were going mouldy before getting ripe enough to peel. He immediately put in a request for Bitter Orange Muffins as he likes the smell of them boiling away on the stove – shame neither of us were able to smell it due to our colds. The final bowl was another attempt at gnocchi. I am worried that this blog may be turning into Appetite for Beetroot as, discovering a final forgotten beetroot in the veg drawer, I decided to attempt the Beetroot Gnocchi from Apples for Jam: Tessa Kiros. I found 2 things out tonight, adding vegetables to gnocchi is not a talent of mine, they always turn out a bit suspect. The second thing is that although the idea of beetroot gnocchi is quite intriguing the reality of eating something quite so pink that is savory rather than sweet is really not to be recommended. It reminded Husband so much of uncooked meatballs that he just wasn’t able to finish them. If anyone fancies trying them then a very similar (identical ?) recipe can be found here – you do need to use more flour if you want to avoid a sticky mess, despite what she Tessa K says in the book. London today for a meeting near the curiously (and historically) named Strutton Ground and Perkin Rents… I always love going through Strutton Ground it’s just so busy and wall to wall sandwich and cake shops, the market, people coming towards you from all directions…and unfortunately for me the Oxfam Bookshop and the discount bookshop. I was almost lead astray in the discount bookshop, I was seduced in by a book on “slow cookers”, felt myself weakening when I saw The New Kitchen:Rose Prince for £3.99 and then I heard the sirens call from the top shelf…I almost gave into the temptation of Falling Cloudberries:Tessa Kiros in brand new hardback reduced to £12.99 but no the money in my pocket was for a purpose, lunch and a gossip with my colleagues. I have been good all month taking a packed lunch to work, not that it saves me much money as whenever I’ve forgotten to bring lunch in the past I’ve usually just gone without. Normally at meetings lunch is provided, but once a year we go for a late christmas lunch which we pay for ourselves – nothing flash we just go for the 2 for £8 meals in the closest pub – it’s the chat that matters, the none work chat with people I see 4 times a year and email the rest. My actual treat was going to be some fresh coriander for the second to last of the 4 Leon Slaw’s I have been working my way through…it started with the beetroot I had left over from Hugh FW’s brownie’s – I couldn’t face cooking them again and I wasn’t in a mood for getting the juicer out. Open Sesame Slaw – just tried a taste of this one, this evening. A dairy free mayonnaise type dressing, made with soya milk (borrowed from Dad), left out the parsley and replaced the broad beans with french beans (in the freezer), discovered half way through that I’d run out of peas so made the weight up with sweetcorn. The only one left to make now is Happy Carrot but that will have to wait until I have found some coriander as both the co op and Budgen’s had sold out…and may not happen at all if the mint in the garden is dead ! Is it possible to be addicted to ginger ? I know that chillis are supposed to be addictive, there is some chemical which not only makes them hot but does something to your brain to make you feel happy – but does ginger have the same properties? I think I may have a problem! I am looking for something to do with the ginger essence, I may try a sponge cake…open to suggestions as I honestly have no idea how you are meant to use it. Yesterday I tried some cooking with Spider, proper cooking, not decorating a pre-bought item or using a packet mix…it was not exactly a success but for different reasons than before, mainly lack of planning by me. Decided to make gingerbread men, mainly because I’m trying to run down my spice cupboard (some of the bottles in there are vintage). We followed a recipe in Apples for Jam: Tessa Kiros and having been prewarned by Lacers Life that it may be a bit runny I added some more flour – at least I think I did, I’m not sure…you see the battery has run out on my scales so I tried to convert the gram measurement into a cup measurement when I noticed that the recipe in the book gave a cup measurement of 2 cups which was twice the amount I’d just worked it out as being. Second problem was I didn’t have enough butter (so added a small bit of soft margarine) and then I discovered I was running out of plain flour so made the difference up with buckwheat. Then I discovered I’d thrown away my baking sheets and had yet to buy replacements…not that it mattered as by that stage I’d reached the bit in the recipe that says “refrigerate for 3 hours”. At this point Spider got bored and went back into the living room to play “knights and castles” – informing our guests later (luscious Lulabelle and her daughter Lulabud) that “We haven’t got any biscuits because Mummy can’t cook”. Lunchtime – In the fridge at the moment I have some pizza dough – correction,the dough is slowly rising. I made the dough itself at 8.30am, just before taking Spider off to pre-school using the dough recipe from Apples for Jam:Tessa Kiros I had to adapt the recipe however as my yeast refused to foam using the method from the book so I adapted the recipe to match the instructions on the tin – will be changing yeast brands as this tin has been very fussy as to what it gets added to! After making the dough I followed a tip from Nigella about leaving the dough to have a long slow rise in the fridge. I have to head off now for a site visit in the wilds of Oxfordshire. Hopefully by teatime my dough will be ready for stretching and rolling and having toppings added. Off to find some mozzarella… I’m also going to buy some new yeast as I was concerned about the dough when I was kneading it, it started off as a little tight ball of dough and stayed that way…now I know that’s not supposed to happen. Dinnertime: The dough did not look promising when I got home, it was a little bit softer than when it went in the fridge. I punched it down, divided it in two and left it to rise a bit more in the warmth of the top oven – in the lower oven I had 2 granite tiles warming up – tip from Jamie at home (who needs a pizza stone). After 30 minutes it was pliable enough to stretch it out as a base. Decided that simplicity was best and just did a simple tomato and cheese (cheddar ) and wow, after about 10 or 12 minutes we had lift off ! If I were to do this again, which I will tomorrow I think the only thing I would change is the dough… don’t know why but it didn’t quite work, I think perhaps my yeast may be on its last legs. I feel a bit like a kid who believes in magic – its been almost as much fun today as the first time I tried developing a photograph from a negative… mind you I did that in my bathroom not my kitchen ! This is our (Me and Spider) version of Tessa Kiros’ PBC. This is our birthday present to one of our neighbours, I’ve been dying to makes this for the 18 months that I’ve owned this book, but its only at Christmas that I can find Pandoro’s at a reasonable price. 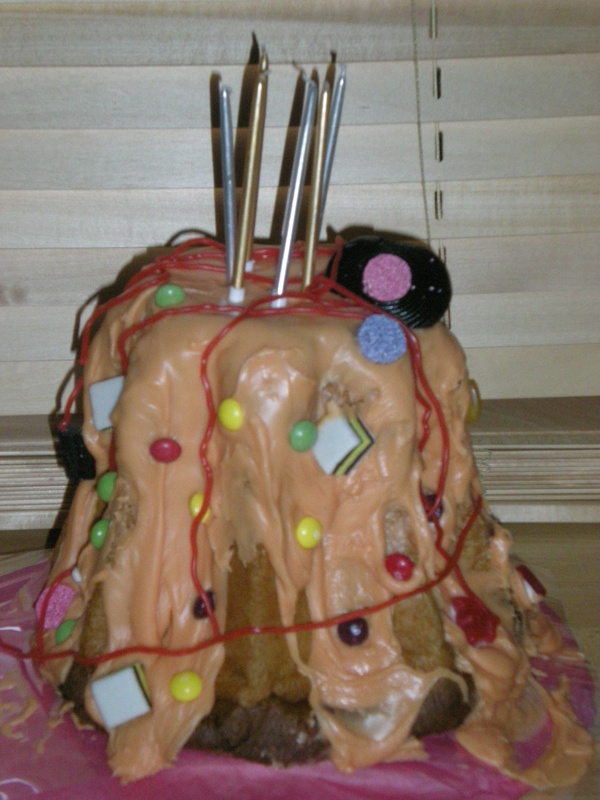 Spider calls this his “volcano” cake as it is vaguely cone shaped and the orange icing does look a bit like lava… Spider doesn’t like following directions which means that if we had actually made and then decorated a cake together we probably wouldn’t be talking to each other as I would be feeling so frazzled by the end of it, this way of doing things means that we remain friends and have fun…whilst we were waiting for the icing to set he entertained me with his virtuoso drumming with wooden spoons on the saucepans – wok lids make great cymbals. Now that its past bed time I am off to deliver the cake…only I’m sure there more sweets on it earlier today…that may explain why Spider was hyper by bed time. To which most people (well bread machine evangelists at any rate) say “what you need is a bread machine, it makes life sooooooo much easier !”. Now I would never under any circumstance knock the joy of a freshly made loaf from a bread machine – in fact I melt into the floor with delight every time Flapjack Queen sends her husband round with a plate of freshly made bread slathered in lemon curd – and yes, a homemade loaf, even in a bread machine, beats the hell out a chorleywood process plastic loaf but I want more than just the bread. Bread is therapy. Making it can be calming – I love the sensuous feel of the dough beneath my fingers, to gently knead and fold – or it can be anger management, many cook books cite the joy of working out your frustrations on the dough with intense kneading, stretching, slamming the dough back down on the surface. I even enjoy watching people making bread – there is a fantastic scene in channel 4’s Real Food series where Nigel Slater makes bread with Emily Green – he has a wonderful, infectious excitement over the feel of the dough, and a childish glee when finally consuming it as a peanut butter and jelly sandwich ! Earlier this year I decided as part of the economy drive to start making bread and bought in a new tin of dried yeast, white and brown strong bread flour. 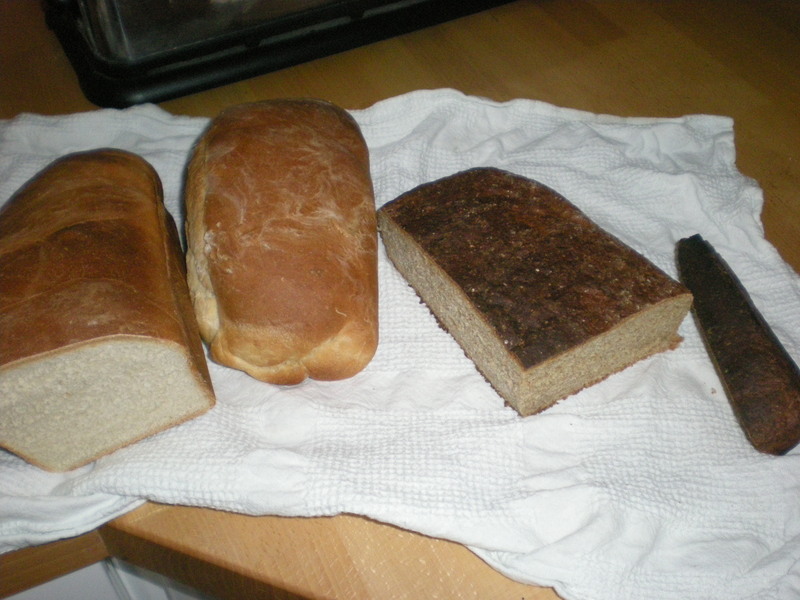 Since then I’ve made bread exactly twice…its because we haven’t bought a full price loaf of bread since march – honest ! OK so its honest we haven’t bought a full price of bread, but not “honest that’s the reason I haven’t made bread”. Basically I haven’t yet mastered the art of the loaf, I keep making mistakes…oh, and as mentioned I lack time in the evenings. [The secret to low price bread is that Husband has been buying end of date bread and filling the freezer with it,we take it out slice by slice as and when needed]. The loaves I have made have been fun though. The first was based on the idea of the Milk Roll which I remember from the ’70’s, roughly following the recipe in Apples for Jam: Tessa Kiros…it made me feel like a proper Mummy (the sort that is not at work from 7-7). Came out a bit yeasty, but slightly sweet. Toddler loved it (which is all that mattered really). Second one was following recipe from Appetite: Nigel Slater for basic white loaf but following the instructions from Emily Green from the Real Food programme (see above) which involved rolling and folding to keep the air in the bread rather than slamming it periodically on the table and wow what a revelation ! This loaf really really rose. It was a very tall loaf, and sort of resembled a brain in shape. Lovely fresh taste, fantastic texture. No yeasty taste this time, but slightly doughy as I took it out of the oven to early – too desperate to taste it I guess. Postscript: Found the time to make the first two recipes from The Bread & Bread Machine CookBook: Ingram & Shapter, one white, one brown, both were a little on the sweet side (too much honey or sugar ?) and the white still had too much of a yeasty taste. The Brown loaf worked quite well except for the fact I got the tin measurements wrong and it ended up in too shallow a tin…very surprised it worked in view of the fact it required less than 1/3 of the usual kneading time. Woke up in a bit of a grump this morning. The Toddler came into our room at an early hour demanding company and then started accusing me of waking him up ! So to cheer myself up on the journey into work I started remembering past times in the kitchen – but got distracted by memories of culinary experiments, some of which were quite funny, which at least made me giggle and got me into a better mood. As mentioned I do have Form for slightly eccentric cooking. Show me a recipe with unusual ingredients and I find it hard to resist the temptation to try it. Sweet Potato and Marshmallow from Feast (Nigella Lawson) This is just cooked sweet potato, with some lime juice baked with a layer of mini marshmallow across the top which gets kinda baked and caramalised and slightly toasted. Having thought that this was the sort of thing that both Toddlers and Teenagers couldn’t get enough of it turned out that neither of them would touch it. Creamy Carrots –(Apples for Jam – Tessa Kiros) sounds innocent enough but it was not appreciated in this house. My fault, I didn’t have any parsley so I used tarragon. But to be quite honest I think carrots are nice enough without adding cream, you just need butter and black pepper. Beetroot Cake This one worked, as long as I didn’t tell anyone what was it it before they tried it. I guess it’s the same principle as carrot cake, but because in the UK beetroot is usually eaten soaked in vinegar, its difficult to overcome people’s fears and get them to try it. It came from Nigel Slater’s Observer column and I carried the newscutting around for several months before I did it, fresh beetroot is not something it is easy to find in the shops out of season (because there’s no demand for it), so I guess this cake wins on the food miles stakes too. It was too tempting to resist as it also had orange blossom essence in it, so how could I not make it ? The thing that I don’t like about it is the linseeds, but that’s just me. I don’t like the sensation of small hard seeds in my teeth so no dried figs in my christmas pud ! If I did it again I’d just up the amount of sunflower and pumpkin and leave out the linseed. There are no doubt many many more crimes and I’m sure that if the Toddler could read, or I pointed the Teenager at this site they would remind me of many more eccentric mixtures I’ve tried out on them. But these are the ones that I can remember over the past 2 years, and besides sometimes the journey to work is only 15 minutes long. A blog to help educate, inspire and motivate people to achieve their own VICTORY! !